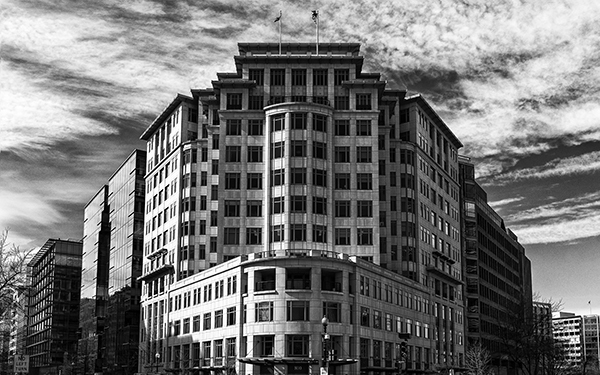 This photograph, taken February 17, was first posted as and a black and white image. Now you can see how it looked in color. 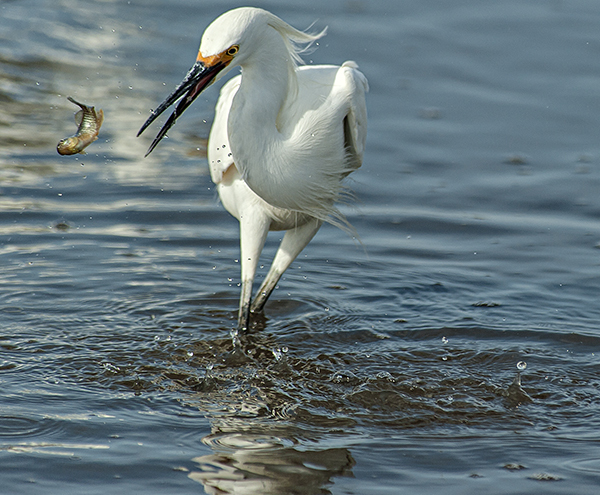 Thanks goes out to the gull who added a little action to the scene. 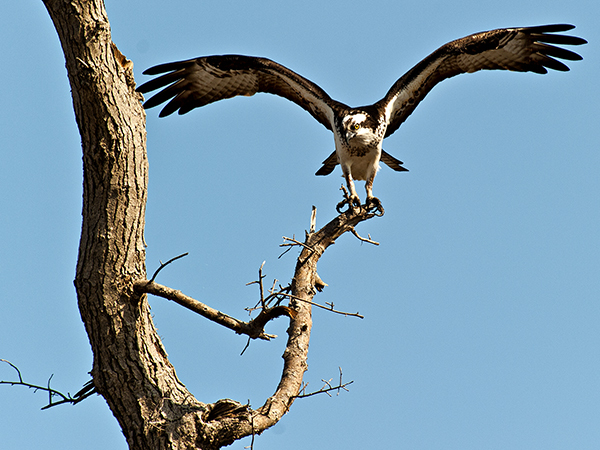 There are reports of Osprey in Sussex County but I haven’t seen or heard one yet in Lewes. I shot this photograph on April 9 last year well after a pair had made, or spruced up, their nest for the season. This Osprey was sitting in a tree just next to the nest which it mate was sitting in. Keep your eyes peeled and your ears tuned to the sky as they will be here soon, a true sign of spring’s arrival. 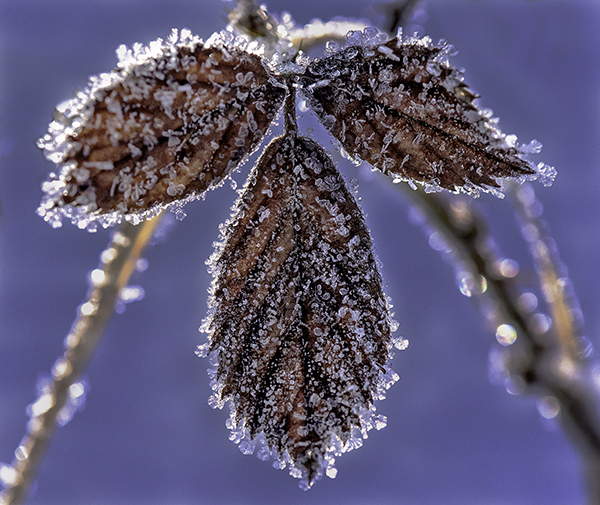 Yes, more hoar frost from last weekend. Cold weather ducks are still working the rocks at Indian River Inlet. 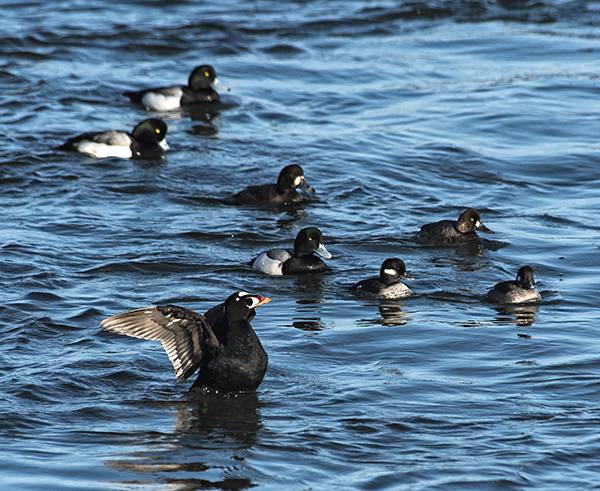 Here are a Surf Scoter, Blue Bills and Buffleheads hanging along the rocks on the north side of the inlet last weekend. As I shoot a subject I often begin to see things that weren’t immediately apparent at first. I saw these three leaves well into the shoot yesterday morning and the symmetry was the compositional element I wanted. I checked the weather conditions last night before going to sleep and saw that it was 7 degrees out (according to Intellicast online) with a dew point of 7 degrees which means fog will form and freeze on surfaces instantly. 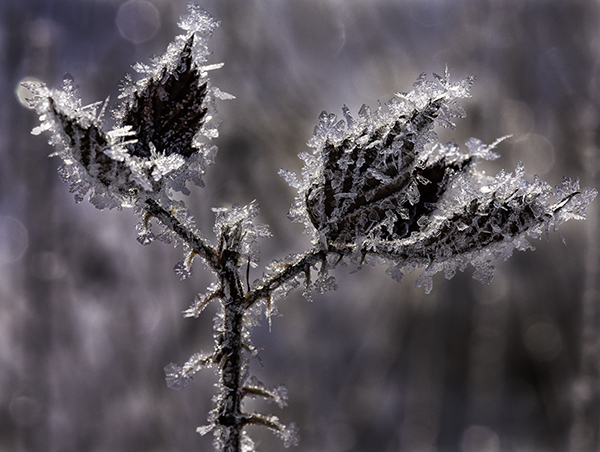 This brings a smile to photographers because a nice thick layer of frost will form on everything. 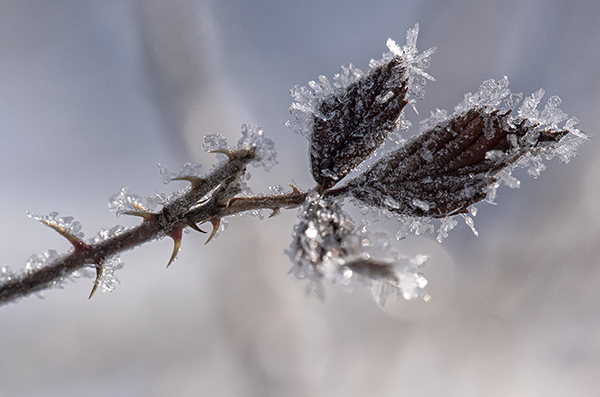 My car confirmed conditions were good so after I scraped off a thick frosty covered windshield I went out to look for frost covered subjects. This thorny branch was one of several things I found. 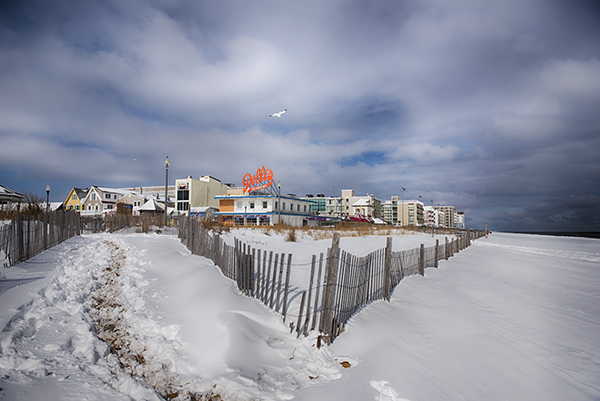 The Delaware Bay has been frozen over a great deal of the past few weeks resulting in unique coastal scenes. 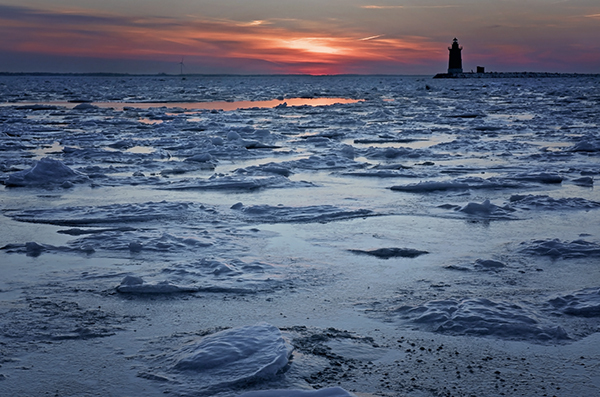 Cape Henlopen was frozen in recently with rafts of thick bay ice that had been driven to shore by the wind. The currents that are always flowing in tidal water shift these blocks of ice around creating occasional open water pools. I found the warm colors of a cold sunset reflected in one of these pools and had to get down within inches of the ice surface I was standing on to maximize the reflection. Snow started later than expected in Lewes today and it took a while to cover surfaces enough to create the kind of winter scene I hoped to photograph. I drove around Lewes late afternoon and just couldn’t find a scene or subject that made me want to stop and set up my camera. This shack on the bank of the Lewes-Rehoboth Canal in Lewes is always an interesting subject with the clever carpentry that gives the illusion of a deck and an open door on its flat front. Kevin Fleming and I shot this in a snow storm a couple of years ago so I returned to it today. 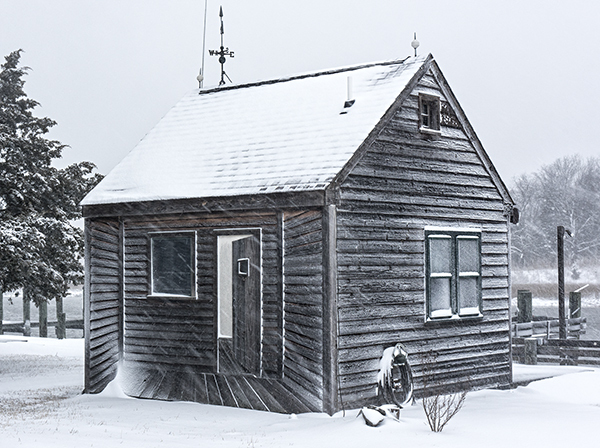 The drift at the bottom left of the shack adds to the 3 dimensional look of the illusion.